To make the cupcakes: Preheat oven to 350. In a small bowl, mix coconut milk and apple cider vinegar together and set aside. In another bowl, whisk together flour, baking powder, baking soda, salt, instant coffee, cocoa powder, and sugars. In a medium bowl, mix together coconut milk and vinegar mixture, vegetable oil, vanilla extract, and almond extract. Stir the dry ingredients into the wet ingredients and mix until combined. Scoop batter into lined muffin tin and bake for about 20 minutes, or until a cake tester comes out clean. Once the muffins have cooled, make the easy ganache and dip the cupcake tops into it. 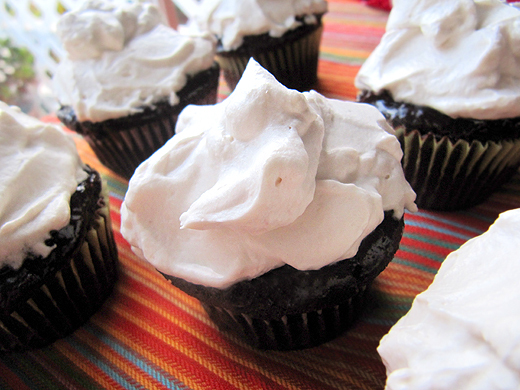 Once they have cooled again, make the whipped cream frosting and top the cupcakes. To make the easy ganache: Using a double boiler, or very carefully in a microwave, melt the chocolate chips with coconut milk. To make the whipped cream frosting: Using electric mixer, beat whipping cream, vanilla, and sugar until stiff peaks are formed. These cupcakes are all about the contrast – a rich chocolaty cake topped with a whipped cream frosting full of vanilla flavor. Mmm, vanilla whipped cream…Ok, so I’m not going to lie. I’m pretty sure the cupcake is being used purely as a vessel for the whipped cream topping. It is just so vanilla-y and light, we can’t stop eating it.